As the name implies, the Focused Inbox is supposed to hold all of a user’s important emails, while Other contains everything else. Users can train the system by moving email to and from the Focused Inbox, and establishing rules about certain senders and subjects. It’s aimed to help mitigate the problem of an always-overstuffed inbox by moving things like promotions, newsletters and other irrelevant emails to a separate screen where they aren’t blocking the view of important messages. The feature learns from a person’s usage patterns, as well. When I had to find a new roommate through Craigslist earlier this month, all of the emails sent in response to the ad I put up went to the Other inbox in Outlook on my iPhone at first. But after that, new messages in really active conversations that I had with prospective cohabitants started cropping up in my Focused inbox. 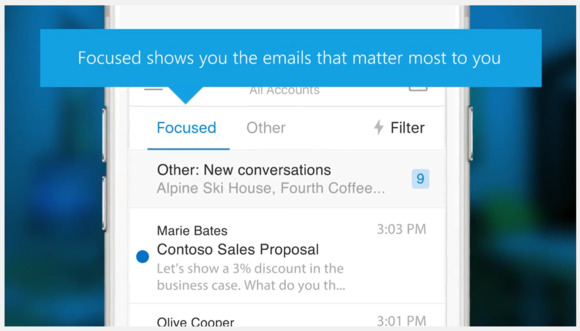 Eventually, the Focused inbox will replace Outlook’s existing Clutter feature, which also uses machine learning to separate important and unimportant emails based on a user’s behavior. The big difference between the two features is that Clutter moves messages to a separate folder, while Focused Inbox keeps all of the emails in the inbox, just changes how they’re displayed. An illustration of how the new “@mention” feature works in Outlook on the web. Outlook on the web is also getting support for “@mentions,” which let users put the @ sign in front of someone’s name in a message. Users who get mentioned will see their name highlighted in blue in the message, along with a large blue @ symbol next to the message in their inbox. It’s possible for people to filter their search results to find only emails where they’re mentioned, which may make it easier for them to seek out messages that include to-do items. When a sender mentions someone, their email is automatically added to the message’s list of recipients, too. The feature seems tailor-made for people who are frequently on large group emails and need an added tool to track what’s actually relevant to them. 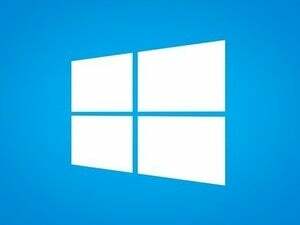 It’s all part of Microsoft’s continued work on Outlook, after acquiring mobile email app Acompli at the end of 2014. The company faces tough competition in the workplace communication space, from Google attacking it from an email standpoint and startups like Slack trying to reduce the use of email through chat and other means.